Mr Hunt Welcomes His SMART New Class! Mr Hunt thoroughly enjoyed getting to know his new class today. As part of our first day back, we reminded ourselves about how to stay safe online. The children thought about our SMART rules. 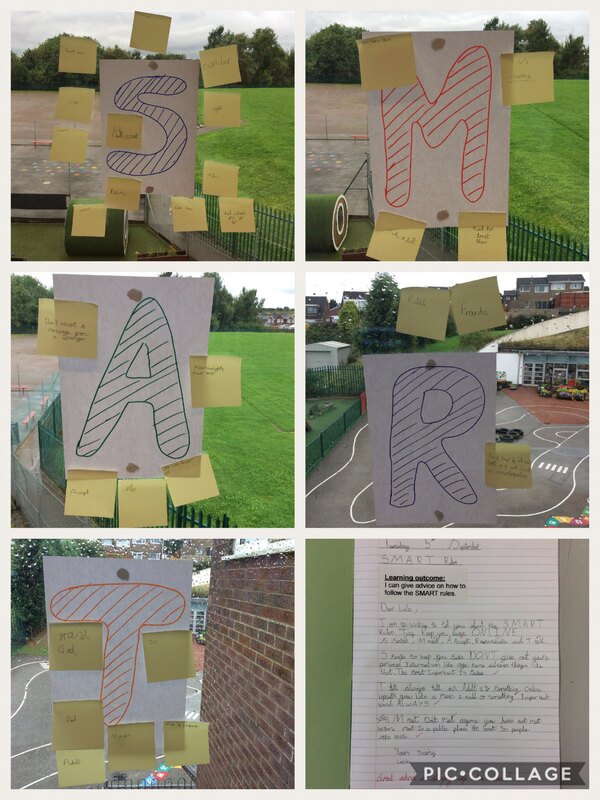 We discussed what the letters in SMART mean, and how we can put them into practise to keep ourselves and others safe. We then wrote letters to give advice to others. The children showed a thorough knowledge and understanding, and were really enthusiastic and hard working throughout. A fantastic start to Year 4. Great work everyone! Can you remember what the letters in SMART stand for? What advice would you give to others to help them stay safe online? Let us know in the comments! This entry was posted in Year 4 and tagged Computing, eSafety on September 5, 2017 by Sandford Hill. A really important lesson for all of us. Remembering the SMART rules really can help keep us all safe in the internet. Why not spend a few minutes talking about the rules with your family members- we think that this would be a great idea. There are lots of useful resources to support you on the school website.